What is the center of the Earth called? In what year was the Soviet Union created? Für welchen Verein spielte Eishockeylegende Wayne Gretzky nie? In which year did the United States invade Canada? What is the nickname for the famous baseball player Babe Ruth? What geographical feature/s might you find in Yellowstone National Park,USA? Welches der folgenden Dinge kann eine “Clutch” sein? Wie bezeichnet ein Mediziner die Verengung von Blutgefäßen oder anderen Hohlorganen? What is the Capital of Westeros in Game of Thrones? In welchem Jahr wurde Cher geboren? Who played the song Run To the Hills? In what city did William Shakespeare based his play “Romeo and Juliet” in? What colour is the leaf in Canada’s flag? What is the beginning of a river called? How many FIFA World Cups has England won? What year did the American Supreme Court rule in Brown v. Board of Education that racial segregation in schools was unconstitutional? Which is the name of the oak seed? Auf welchem Kontinent liegt die Bergkette der Karpaten? What do Shania Twain, Nelly Furtado, Avril Lavigne and Alanis Morisette have in common? Question : What do Shania Twain, Nelly Furtado, Avril Lavigne and Alanis Morisette have in common? 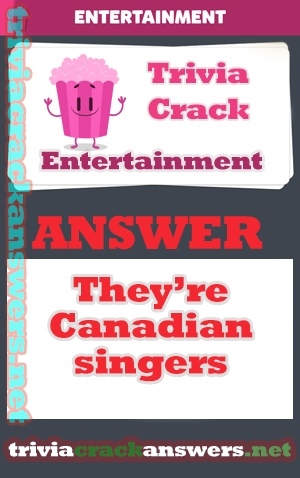 Answer : They’re Canadian Singers.